König von Frankreich (1551-1589). 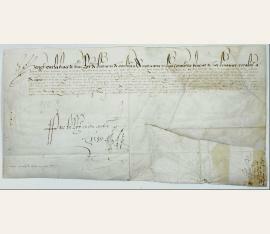 Document signed ("Yo el Rey"). Poitiers. 1 S. 240:490 mm. Auf Pergament. As "Roy de France et de Pouloigne" (!) 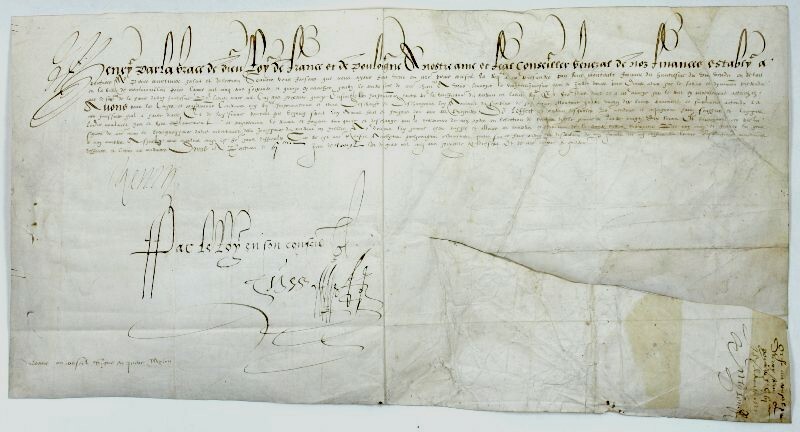 on privileges for René Montault, "fermier du huictiesme du vin vendu en detail en la ville de Montmorillon". - Somewhat dusty and wrinkled; right half with large incision. Schriftstück mit eigenh. U. ("Yo el Rey"). 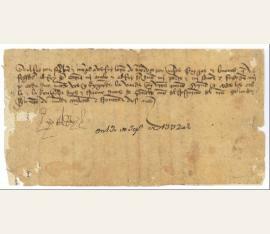 Confirms the right of Ruy Lopéz de Mendoza to wear a sash in acknowledgement of his services rendered to Kings John I and Henry II. - Henry III, known as "El Doliente" ("the sickly"), was the son of John I of Castile and León and of Leonor of Aragón. His marriage to Catherine of Lancaster (daughter of John of Gaunt, 1st Duke of Lancaster, and Constance of Castile, eldest daughter of Pedro I) brought an end to the decade-old feud between the two dynasties. - Several paper defects and tears (not touching text); somewhat brownstained. Exceedingly rare.